Multiple insults to shark populations - fisheries, habitat degradation, the fin trade, climate change - are believed to be interacting to cause steep declines in the numbers of many species. It is difficult, however, to accurately estimate the population size of wide-ranging pelagic sharks. It is even more difficult to tease out the individual contributions of each process to overall declines in shark numbers. Fisheries certainly play a role, with many species of shark either intentionally targeted or taken as bycatch. One way scientists try to estimate shark population numbers is from data supplied by these fisheries, which self-report the species, numbers and locations of sharks they catch. This reporting is likely done honestly by some fishers, but numbers may be altered by others, or reports may not be given at all. There is an inherent bias in having the industry that is most impacted by regulations on shark fishing providing the information that determines those regulations. It has long been believed by researchers that, either by oversight or intent, the catch data on sharks is significantly under-reported. 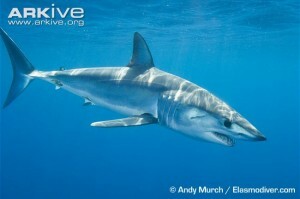 One shark species whose conservation status is of concern is the shortfin mako (Isurus oxyrinchus). Shortfin makos are listed as Vulnerable on the Red List of the International Union for Conservation of Nature, indicating a species whose numbers should be managed to prevent a critical decline. Despite this IUCN listing, the International Commission for the Conservation of Atlantic Tunas (ICCAT) which makes recommendations for Atlantic Ocean commercial fisheries, considers shortfin mako populations as stable under current fishing pressure. This type of discrepancy in population status is not uncommon for oceanic sharks, where it is difficult to assess populations and the true level of fishing is unknown. In US Atlantic waters, recreational fishing of shortfin mako is allowed for specific sizes, although catch and release is encouraged. Numerous projects have attempted to determine the loss of sharks to fisheries by tagging animals with conventional tags, and requesting that fisheries report their catch of tagged animals. This approach also relies on fishery self-reporting, however, and a high percentage of tags that are lost prior to capture introduces further error into the data. A recent project satellite tagged shortfin mako sharks to determine their migratory patterns. Forty sharks were tagged off the coast of the Yucatán Peninsula of Mexico, and off Maryland USA, and were followed for an average of 358 days. The tagged sharks passed through the waters of 19 countries during the time of the study, illustrating the wide-ranging movements of this species. Although not the intent of the study, the authors realized that their tracking data allowed them to identify interactions of the tagged sharks with fisheries, and to quantify the number of sharks that were taken. When a tagged shark was captured in a fishery, for example, the satellite track would often show that tag traveling in a straight line towards the nearest port. The researchers could determine not only the time and place of death of a shark, but by following the tags and speaking with the crew of a vessel, they could determine the country of origin of the ship, and the method of capture. Of the 40 study animals, 12 (30%) were taken by fisheries within the ~1-year average lifetime of the tags. Vessels taking these sharks were from Canada, USA, Mexico, Spain and Cuba, and 10 of the 12 animals were caught on long-lines. When the researchers extrapolated this harvest to overall fisheries self-reporting data, they found that data under-reported the catch of shortfin mako sharks by as much as 10-fold. The authors also found that the revised number of mako sharks being caught exceeded that which was sustainable, in other words the sharks are being overfished. These data show a need for increased protection for shortfin mako sharks from fishery harvest, and indicate that regulations must be coordinated among the many countries fishing the western Atlantic. Similar approaches should be applied to study other shark species, as under-reporting may be widespread in Atlantic fisheries.